As a child, I remember singing with my class the song We Three Kings during an elementary school Christmas concert one evening before our Christmas vacation. Of course, no public school would dare do the same today, but the fact remains that as a young child, it was the first time that I heard about kings in the Bible. Growing older, I have since learned that there were many kings in the Bible. However, there are three that I consider to be quite influential. Although there are many kings found in the Bible, the first king mentioned when it comes to Israel is King Saul. In 1 Samuel 8, we learn that Samuel, the prophet of Israel, was upset because the elders of Israel no longer wanted to follow the leadership of Samuel because he was old and his sons were wicked and corrupt judges over Israel. Instead, they wanted a king to rule over them like the kings that ruled over the heathen nations around them. Samuel was upset that the people had rejected him and prayed to God about it. God told Samuel to listen to what the people were saying: that they were not rejecting Samuel, but they were rejecting God from reigning over them. 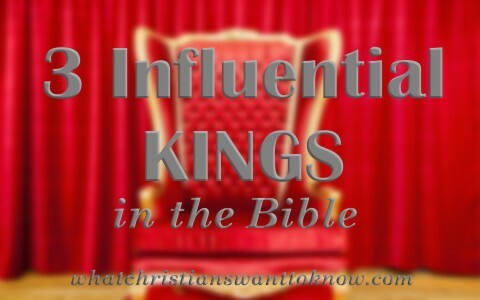 God followed by telling Samuel to let the people know that if they had a king to rule over them that there would be many things that the king will do that would not be pleasing. God went on to list things like taking their sons to serve in his army; work in the king’s fields; levy taxes; and take their sons and daughters as his servants. Samuel told the people what God had said, yet they insisted that they have a king to rule over them like the other nations. Not long after, God gave them King Saul. We find from Scripture that Saul was the first king of Israel. He was tall and handsome (1 Samuel 9:2). He was known in his early years as being humble (1 Samuel 10:22). And, he lived a life that was self-controlled (1 Samuel 10:17-27; 1 Samuel 11:12-15). We see that with time, Saul succumbed to his fleshly desires, which resulted in his loss of the kingdom. He was impatient and prone to doing things he should not due instead of waiting (1 Samuel 13:8-14). He would not do what God told him to do (1 Samuel 15:10-23). He was prideful and jealous when he was not given attention (1 Samuel 18:6-11; 1 Samuel 19;1). He sought advice from ungodly people (1 Samuel 28:7-25). Finally, he committed suicide because he did not want to die in battle at the hands of his enemies, which caused others in his army to flee from protecting their cities (1 Samuel 31:1-7). 2 Samuel 5:1–4 Then came all the tribes of Israel to David unto Hebron, and spake, saying, Behold, we are thy bone and thy flesh. Also in time past, when Saul was king over us, thou wast he that leddest out and broughtest in Israel: and the LORD said to thee, Thou shalt feed my people Israel, and thou shalt be a captain over Israel. So all the elders of Israel came to the king to Hebron; and king David made a league with them in Hebron before the LORD: and they anointed David king over Israel. David was thirty years old when he began to reign, and he reigned forty years. David was a close friend of King Saul’s son, Jonathan. Because of His special relationship with the Lord and close reliance upon God as a young boy, God chose him to be king over Israel after Saul (1 Samuel 16:1-13). David trusted God for courage (1 Samuel 17:12-58). Because of this, he was appointed as a young man to be Saul’s armorbearer and play music for the king when the king was troubled by an evil spirit from the Lord (1 Samuel 16:14-23). As a musician, David wrote and sang about half of the Psalms under the inspiration of the Holy Spirit (1 Samuel 16:14-23). He fled and acted insane when King Saul was seeking to kill him (1 Samuel 21:1-15). He was anointed as king by the tribe of Judah and reigned 40 years (2 Samuel 5:1-5). As king, David demonstrated some of the same tendencies that he had when he was younger. However, God saw early on the David was a man after God’s own heart and established him as an ancestor of the Messiah, Jesus (1 Samuel 13:14; Acts 21-23). Despite this, he also made poor choices. David took another man’s wife in adultery and arranged for the man to be killed in battle so that he could marry her (2 Samuel 11). He suffered the rejection and death of his son, Absalom (2 Samuel 15-18). Finally, although God greatly loved and chose David to be king, He did not allow David to build the first temple. Instead that responsibility was given to David’s son Solomon. Despite the disappointment of David in not being permitted to build the temple, he made every effort to provide what Solomon needed for the task to be done. Revelation 19:13–16 And he was clothed with a vesture dipped in blood: and his name is called The Word of God. And the armies which were in heaven followed him upon white horses, clothed in fine linen, white and clean. And out of his mouth goeth a sharp sword, that with it he should smite the nations: and he shall rule them with a rod of iron: and he treadeth the winepress of the fierceness and wrath of Almighty God. And he hath on his vesture and on his thigh a name written, KING OF KINGS, AND LORD OF LORDS. Although there are many more kings that could be mentioned, when you examine each one, most had good and bad points. Likewise, some were downright wicked. One such king was Coniah, son of Jehoiakim, King of Judah. He was so wicked that God cut him off from ruling and cursed his lineage so that none of his descendants would ever sit on the throne (Jeremiah 22:20-30). This is particularly interesting because Joseph, the step-father of Jesus, is one of Coniah’s descendants (Matthew 1:11). Therefore, Jesus inherited His earthly right to the throne as a man through his mother as the lineage of kings passed through that branch of the family (Luke 3:27). I mention this because Jesus Christ is the Lord of lords and the King of kings. Just as He is fully God and fully man (Luke 1:46-47; John 20:28; Titus 2:11-14), He is also the King of the Kingdom of God and the King that sits upon the throne of David (Psalms 11:4-7; Psalms 110; Matthew 25:31; Acts 2:29-30; 1 Corinthians 15:20-28; Revelation 3:21; Revelation 4-5). However, unlike other kings, Jesus is the perfect king. While His kingdom is not of this world, His rule and reign reaches to every corner of creation to the deepest of hearts. Despite this, His method of ruling is not one of tyranny and humanistic tendencies that even the best of all other kings demonstrate. Instead, He rules from a foundation of love, from which He inspires us to love Him and serve Him by loving our neighbor, even when our neighbor does not deserve to be loved (Matthew 5:43-48; Mark 12:28-33; John 18:33-37; Romans 13:9-10; 1 John 4:19; 1 John 5:1). If we think about it, in light of the perfection and majesty of our Great God and King, Jesus, do any of us deserve to be loved? No! Yet, our perfect king demonstrated that while we were yet sinners, He died for us. Therefore, we should give of ourselves to loving Him and our neighbor, which is our reasonable service (Romans 12:1). While we can sing songs of the three kings, it is only one king that was deserving of the gifts of gold, frankincense, and myrrh. While many kings have lived, and died upon this earth, we find that none were perfect. Therefore, no matter what our station in life, we must look to the King of kings and the Lord of lords for leadership, protection, sovereignty, and love. In doing so, we hope to emulate Him to a lost and dying world that is openly rebelling against His Kingdom. Previous post: How Should Christians Respond To Bullying? Next post: What Is A Reprobate Mind?